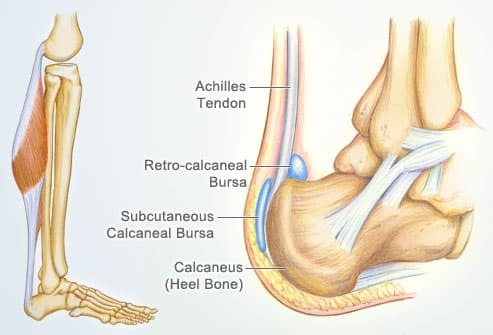 Achilles Tendinitis Not Going Away? Most people that try to maintain an active lifestyle have at some point experienced pain in the back of their heel or along their heel cord. This is usually associated with Achilles tendinitis which is inflammation of the Achilles tendon along the back of the heel and ankle joint. Usually people that suffer from Achilles tendinitis also have very limited flexibility to the Achilles tendon and hamstrings. So what does Achilles tendinitis feel like? You may feel sudden burning or sharp pain at the back of your heel that either stays localized to the thick part of the tendon or radiates up the back of your leg. It may not occur until you increase your activity level or perform motions that involve more load on the ball of the foot. Achilles tendinitis can come and go, which causes people to ignore it initially. How can you treat it? If you just started experiencing Achilles tendinitis, RICE therapy (Rest, Ice, Compression, and Elevation) should be initiated immediately afterwards. Then try taking an anti-inflammatory such as Ibuprofen or Motrin. Rest for several days before trying to return to your activity that elicited the pain. Try performing some stretching exercises such as a runner’s stretch or bending forward to touch the toes so you can increase flexibility to the Achilles tendon. Increasing flexibility to the Achilles tendon, helps reduce tension at the insertion site on the heel, which in turn, helps alleviate symptoms of Achilles tendinitis. If you are still experiencing pain in the back of your heel or along your Achilles tendon, even after you’ve tried the treatments mentioned above, then you should see a podiatrist. Prolonging treatment for Achilles tendonitis may cause the condition to worsen and make it harder for your doctor to treat! At Advanced Podiatry, our doctors have several treatment options for Achilles tendinitis that are natural treatments which not only reduce pain but also prevent it from recurring. Use of orthotics and super pulse laser treatment are just a few natural options available for people that want to get rid of their Achilles tendon pain once and for all! Call Advanced Podiatry at 813-875-0555 for an appointment today!